Posted on Nov 6 2017 at 4:53 pm. Through support from the Metcalfe Foundation and project leadership of Trinity St. Paul’s and Faith and the Common Good, ArtsBuild Ontario and the Toronto Arts Council travelled to Philadelphia to see how their sacred spaces are evolving to also be creative spaces. Our aim was to investigate how sacred spaces are working with arts organizations to transform their facilities into spaces that also serve the creative community. 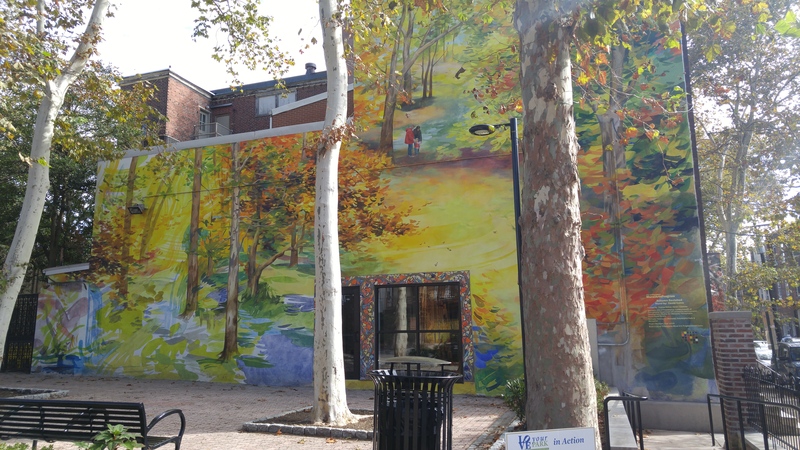 Philadelphia was our first city stop in exploring communities outside of Toronto that are adapting or repurposing sacred spaces for artistic use. There are already some examples within the province of sacred spaces working alongside arts organizations in one shared facility. But we wanted to explore how other communities outside of Ontario are approaching this model, how they are thriving and what challenges they are facing. From site visits and meetings with both sacred space administrators and arts organizations, our goal is to better understand where our sacred/creative spaces are headed, in Toronto and across Ontario. We wanted learn how arts organizations and sacred spaces are operating in the same space, exercising respective mandates, and sustaining their practices. It is not new news that artists and arts organization are actively using sacred spaces for their work. 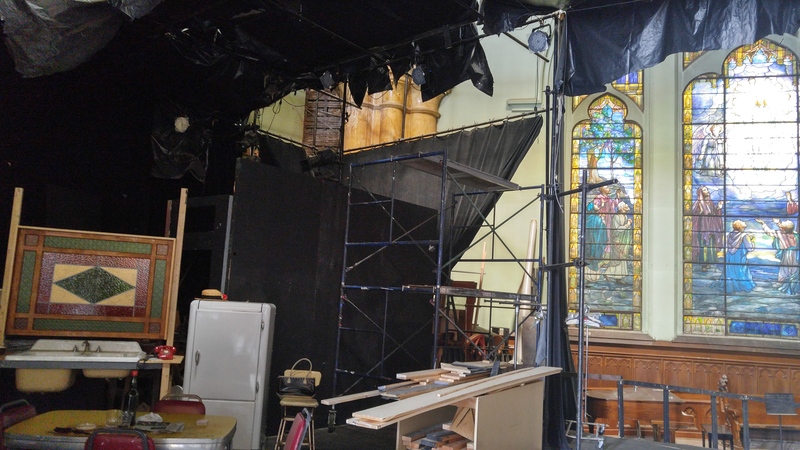 More and more, we are seeing arts organizations hosting performances, rehearsals, workshops and meetings in churches – the space is often available and creatives need it. Philadelphia has a number of historic structures, including many churches that span from one to two hundred years old. The population is dense and diverse throughout the city’s neighbourhoods. As parish numbers decreased, some churches opened up their doors to other community organizations as well as local arts groups. Other church buildings have become adaptive reuse spaces for artists and arts organizations. 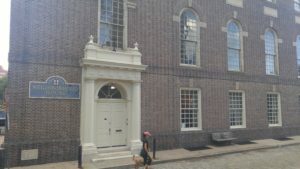 Philadelphia is also the home base for Arts in Sacred Places – a branch of Partners for Sacred Places that brings together artists and arts organizations that need space for rehearsals, studios, performances, offices and other functions with congregations and houses of workshop who have unused or underused space. 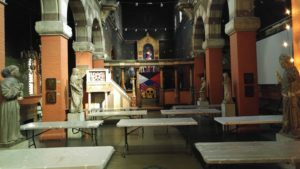 Through past work with scared spaces in Philadelphia, Arts in Sacred Places took us to a number of churches that are operating both as functioning parishes and arts spaces. 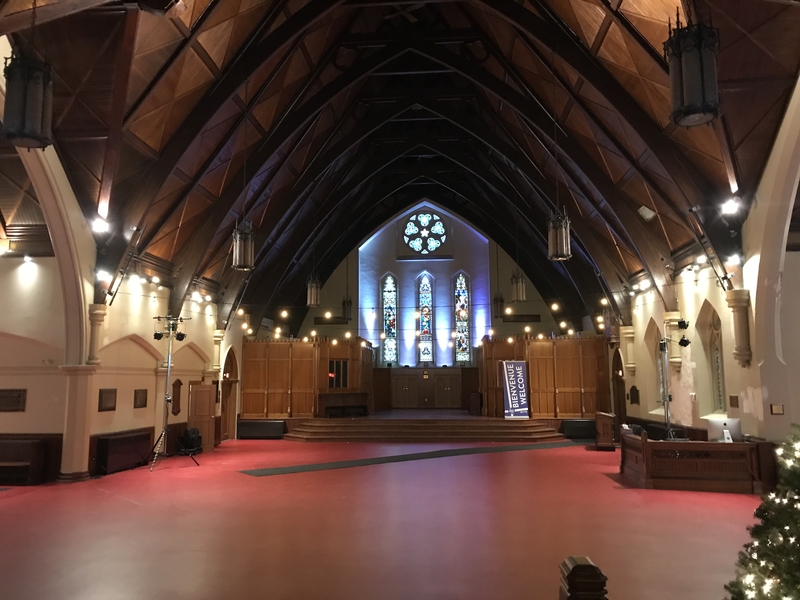 They also showed us a few adaptive reuse creative spaces of former churches that have been renovated for arts organizations and entrepreneurs. 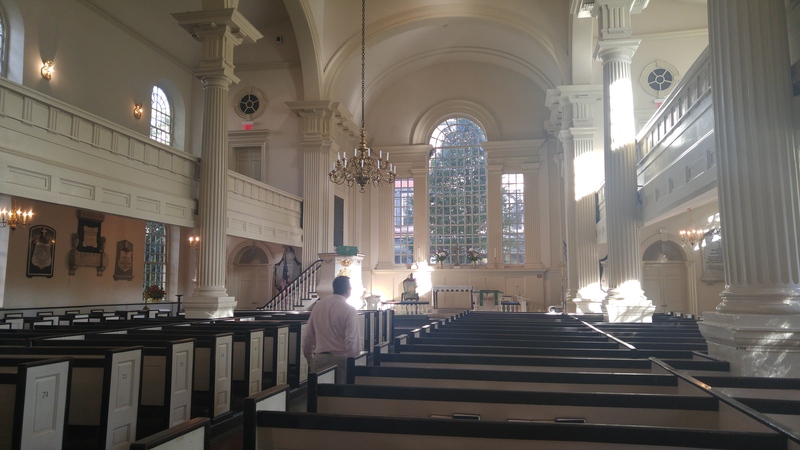 While we saw a number of sacred spaces in Philadelphia, we wanted to share three spaces that stood out to us during the trip. 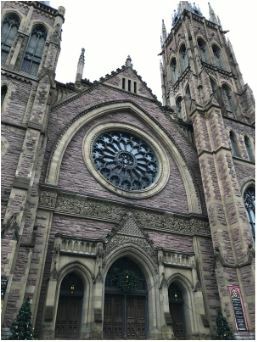 The Neighborhood House was built by the Christ Church parish in 1915 to serve the residents of the industrial Old City. Eighty years later, local artists seeking unusual, flexible and affordable space discovered the building. Today the Neighborhood House serves cross-disciplinary performing artists, offering subsidized performance and rehearsal rentals. They have a 2000 square foot theatre, a Great Hall, sanctuary, and meeting room available to rent. They have over 50 artists and ensembles using their space each year. 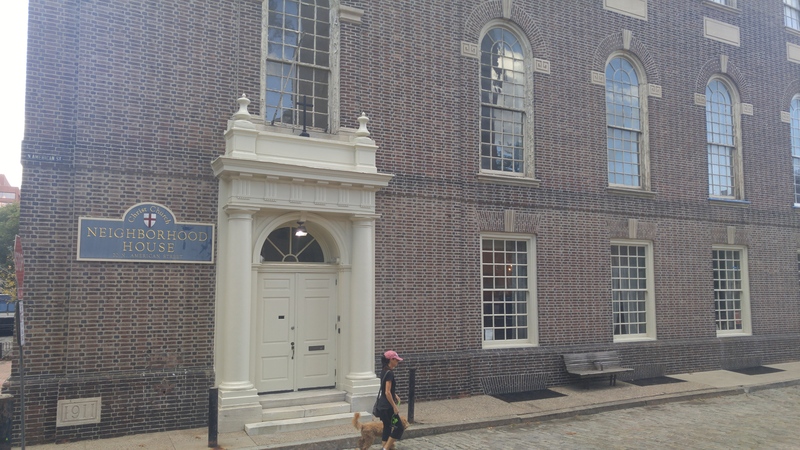 Fleisher Art Memorial is made up four heritage buildings including the St. Martin’s College for Indigent Boys and Church of the Evangelists. 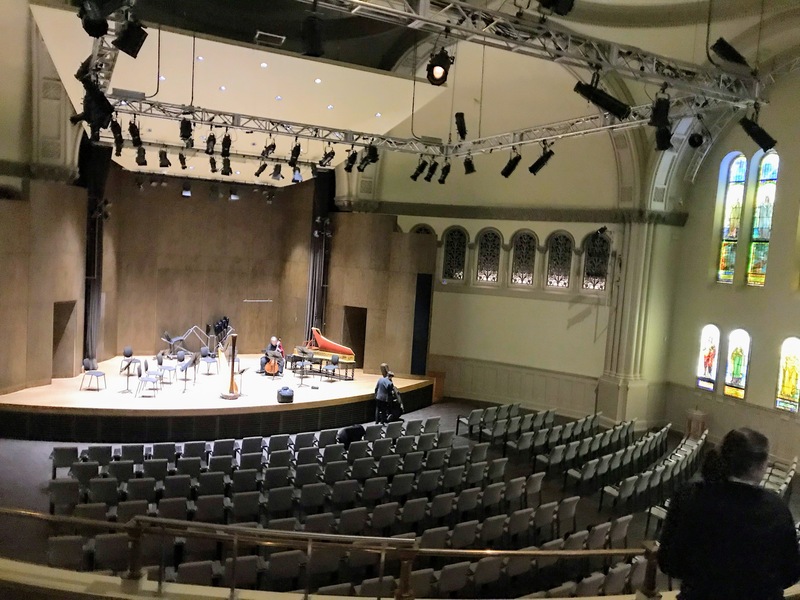 Listed on the National Register of Historic Places, Fleisher Art Memorial has fully adapted a church, college and two roadhouses into a nonprofit community art school. The school has studio spaces available to rent, exhibition space which displays student and community works, and a sanctuary that actively houses art programs. The sanctuary is a striking space, with the original walls, stained glass and pulpit in place from 1884-1886. The Calvary Centre for Culture and Community is the operating body of the Calvary United Methodist Church. Located in West Philadelphia, the church has positioned itself as a community hub, serving over 5,000 members each year. The church is still active, but after congregation numbers began to decrease, they opened their doors to artists, community organizations and other religious groups to use their facility. They currently use the Chapel as rehearsal and worship space for Jewish, Muslim and Christian groups. Meanwhile, their sanctuary holds a fully erected black box theatre where their resident theatre company rehearses and performs. The rest of the facility provides ample space for rehearsals, twelve steps groups, refugee groups and so much more. These are just three examples of sacred spaces evolving into creative spaces, and yet they remain diverse in how they operate and who they serve. 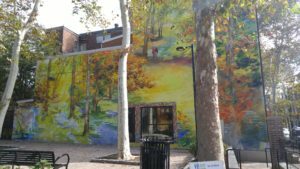 The biggest commonality in all the spaces we visited in Philadelphia was the strength and sustainability that arts organizations and sacred spaces found in partnership with one another. Rather than go at it alone, we saw churches leverage the space they have by inviting artists and creatives to make a home in their facility – and in most cases, both are helping each other to fulfil a mandate to serve their communities with the arts. We also saw some great examples of former churches that have become adaptive reuse spaces for artists and creatives. 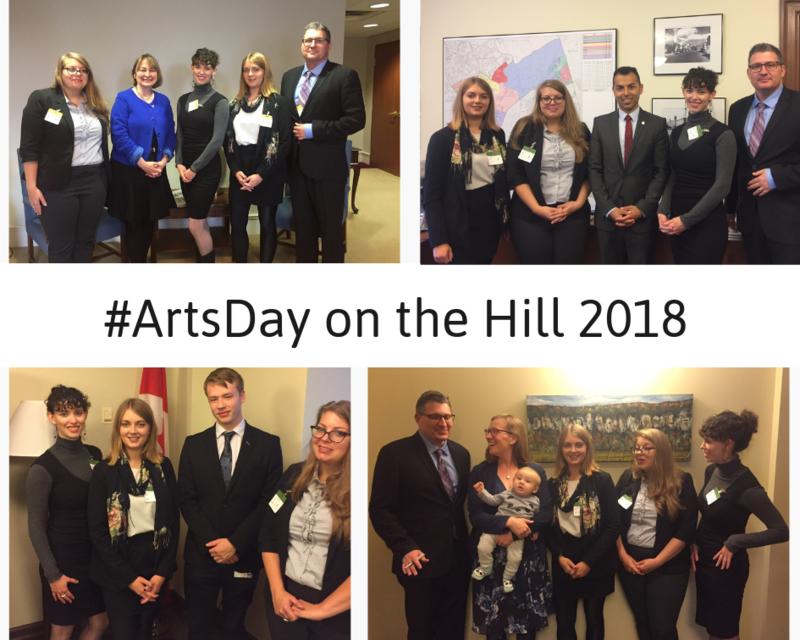 We will be on the road again to other cities outside the province to see how their sacred spaces are incorporating arts and culture within their walls. Following our research, a final report of our findings will be shared with the public. We look forward to sharing highlights from our next trip in the New Year – stay tuned!